Another baking post! I recently - well a couple of months ago, got my hands on some matcha powder for a decent price. I was buying a sushi/sashimi platter from Suzuran in Camberwell and whilst waiting for my food I decided to wander around the grocery section of the store. I've found it really difficult to find matcha powder in normal Asian grocery stores. 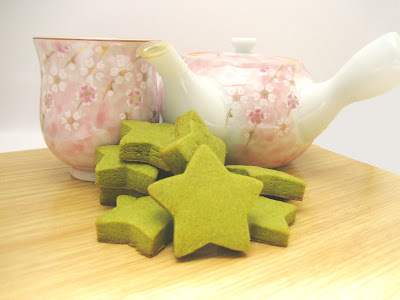 I love all things green tea - especially ice-cream, frappes and cookies. I spent the first couple of weeks with my precious matcha powder just adding it to some vanilla ice-cream and inhaling it all before I was forced to share it with Pruet - definitely worth the ice-cream headache that followed. In Japan they have the most amazing green tea flavoured products - what else but green tea oreos and green tea kitkats? I think we finished all the ones we bought as gifts before we even landed back in Bangkok. 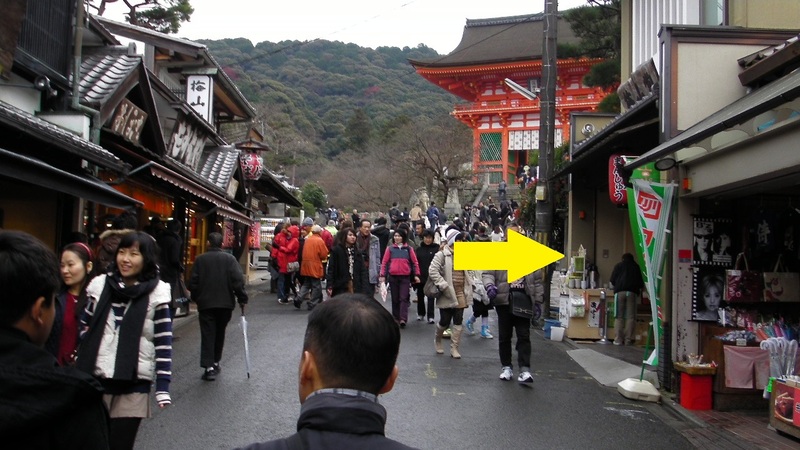 Whilst in Japan visiting Kiyomizudera, one of the famous temples, we got side-tracked by the numerous food shops and free shelter from the rain on the walk from the bus to the entrance. This is the shop! No idea what it is called, but can't believe I have a photo of it! One of the shops had samples of the most amazing matcha cookies EVER. Even after two year the idea of them still makes my mouth water.They were a deep green colour with a slightly bitter after taste. I bought a box thinking I could hoard it for myself, but alas, we actually forgot to get a present for Pruet's stepmum, who had kindly given us spending money for our Japan trip. In our defence between grabbing individual presents for our immediate family members and my Malaysia relatives and Pruet's grandaunts - all of them, we got a little forgetful. So what better way to repay her than to relinquish my most prized cookies - they were super special. 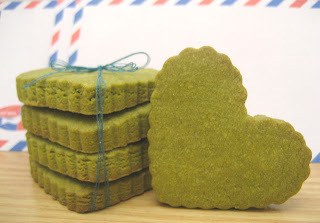 Although I haven't been able to replicate them, some blog trawling turned up this tried and true matcha cookie recipe from lovescool - which won pastryscoop's Golden Scoop Awards. 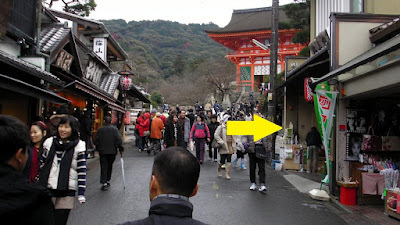 There is a post on the different variations here and links to the blogs which tried them. Store the egg whites in the fridge for a couple of days or freeze them. Or use them straight away for macarons. Sift the matcha powder and icing sugar together. Beat the butter and matcha/sugar with an electric beater. Continue beating the mixture until it is uniform and smooth. Add the flour and beat on low speed, until well combined. My dough was very crumbly at this point, so I added a little extra butter. If you look closely you can see on the right the indentation of my fist - I was able to compact the crumbs together but was not quite able to make a ball. My dough wouldn't form a ball so i just pulled the edges of the plastic wrap to enclose it all to chill. Preheat the oven to 350F/180C. Line a cookie tray with baking paper/silicon mat. Roll the dough out to 1cm thickness and use cookie cutters to cut shapes. I don't have photos of the dough as my fingers were covered in it. The mixture itself was not that sticky, and I only had to wipe down my rolling pin. Bake the cookies for for 12-15 minutes, or until slightly golden around the edges. Ps. 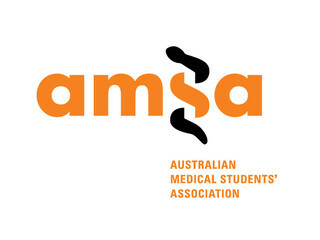 If you have time and have not already done so please click the link to sign the petition to support an increase in medical internship places in Australia to actually help ease the doctor shortage.